For your listening pleasure, after a brief and unintentional hiatus, I offer this fine folk record on this nice Gennett Supertone by WLS artist Chubby Parker. Frederick R. “Chubby” Parker, born in 1876, was a Chicago-based banjo player and folk singer popular on the National Barn Dance on WLS radio in the 1920s, which was a precursor to the famous Grand Ole Opry. Parker was born in Lafayette, Indiana, and graduated from Purdue in 1898 as an electrical engineer. He reportedly worked as a circus performer, and later as an electrician, patent attorney, and inventor in Chicago before turning to radio. Parker became a very popular performer on WLS and allegedly received almost 3,000 fan letters in one week in February 1927. He left radio and recording after 1931, with one final appearance on WLS in 1936. He died in 1940. Supertone 9188 was recorded on February 26, 1927 (perhaps the same week he got all those letters) in Chicago, Illinois, recorded by the Starr Piano Company, producers of Gennett Records. Radio station WLS (an acronym for “World’s Largest Store”) was owned by Sears, Roebuck & Company, and they were eager to market records by their popular radio artists on their record labels such as Silvertone and this Supertone. 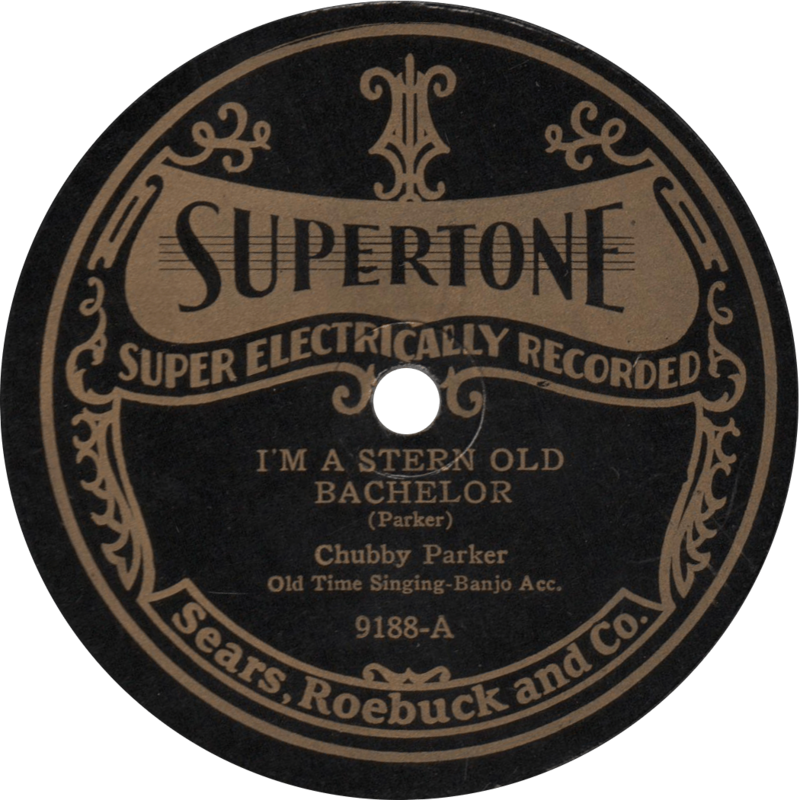 Parker’s “I’m a Stern Old Bachelor” is probably the first recording of this folk song, but I can’t guarantee it, and I haven’t researched it in depth. I’m a Stern Old Bachelor, recorded February 26, 1927. Parker’s excellent “Bib-a-Lollie-Boo” has the distinction of being featured on Dust-to-Digital’s fine multimedia set “I Listen to the Wind that Obliterates My Traces”, and features some gems of lyrics that can be found in the little widget that displays song lyrics at the top of the home page of this site. 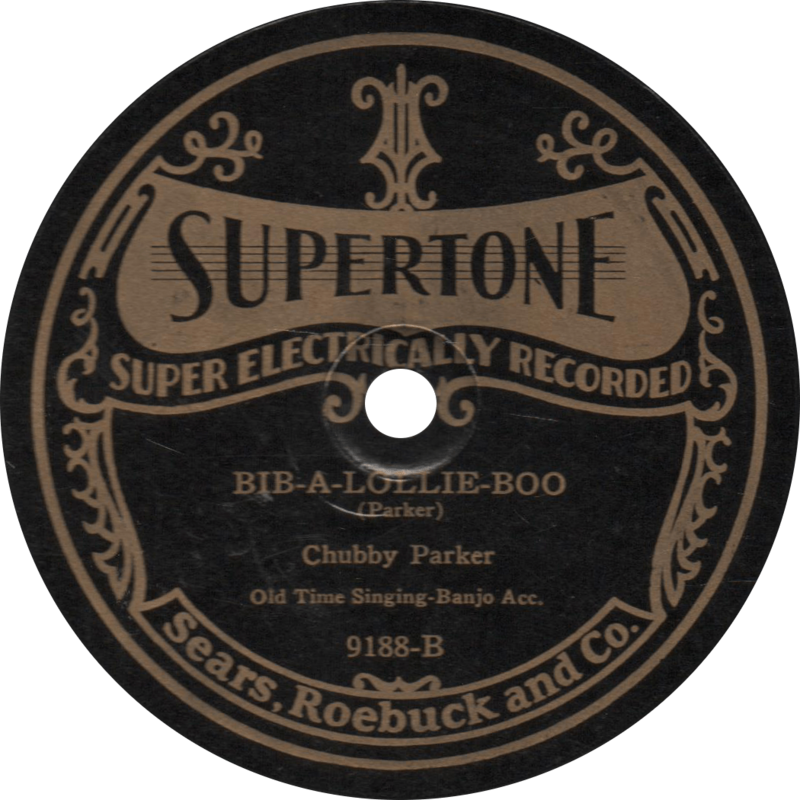 Bib-A-Lollie-Boo, recorded February 26, 1927 by Chubby Parker. Updated with improved audio on June 10, 2017. This entry was posted in Records and tagged 1920s, 1927, Chicago, Chubby Parker, Folk, Hillbilly, Radio, Starr Piano Co., Supertone, Vaudeville, WLS National Barn Dance by R. Connor Montgomery. Bookmark the permalink.